What are all those slogans on the truck??? We have dedicated this truck to raise awareness of the physical disabling disease called Multiple Sclerosis (MS). 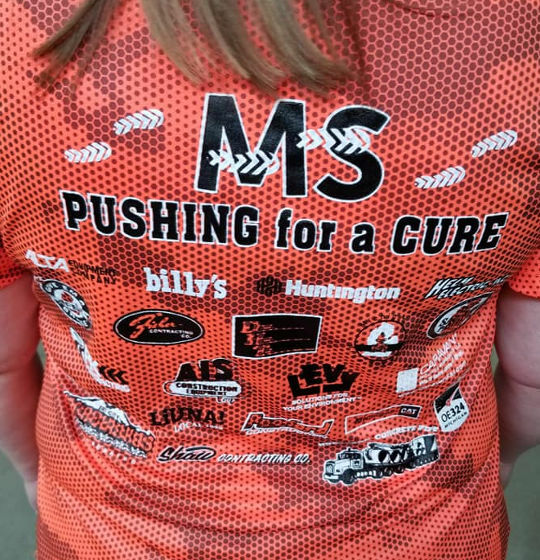 Champagne & Marx Excavating is "Pushing for a Cure" to end MS. We have joined the MS Movement towards finding a cure for MS. MS stops people from moving, what better way to remind people to "join the movement" than a 50 ton gravel train rolling down the road. Along with raising awareness, our hope is to raise funds to help patients who been diagnosed with the disease. By making a donation, you are supporting research, and local programs and direct financial assistance for the more than 18,000 people living with MS in Michigan and their families. Click Donate to make a secure, tax deductible donation online with a credit card. Any amount, great or small, will make a difference in the lives of people with MS. Anyone who wishes to join one of Champagne & Marx's MS Teams (MS Bike or MS Walk), please Contact Us. © 2018 · Champagne & Marx Excavating, Inc.